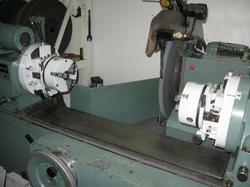 In the field of On site crankshaft grinding we have over 33 years of experience. 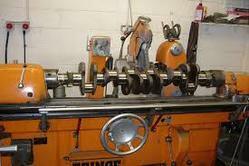 We are the Crankshaft specialists which include Onsite Rotor Shaft Grinding, onsite rotorshaft repair having both the experience and expertise to handle any kind of On site Crankshaft grinding problem. Our team comprises of highly qualified engineers who are trained in crankshaft forging and crankshaft machining facilities based in Europe and U.S.A. We have repaired/reconditioned over 10,000 crankshafts of different make within India and abroad. With portable in situ crankshaft grinding equipment our technicians come to your works or vessel to repair worn out or damaged Crankshaft Crankpins, Crankshaft Main Journals, Thrust Faces, Keyways and other parts of your Marine or Industrial Crankshaft quickly and cost effectively using insitu grinding. We do this using our own crankshaft grinding equipment. This leads to a great time and cost saving in most cases. 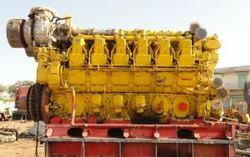 There is no need dismantle crankshaft and to arrange for safe transport to a workshop which is usually far away. We have developed specialised portable on site crankshaft grinding machine which can be set up on the crankshaft requiring repair using the latest techniques to ensure correct alignment and accuracy. The new generation on site crankshaft grinding equipment can do machining and polishing in one setting itself as there is no need of separate tools for grinding and machining. 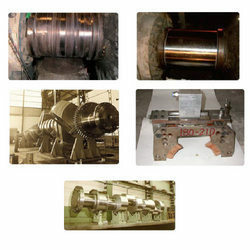 Crankshaft can be ground from the CR Pin dia of 50mm upwards. 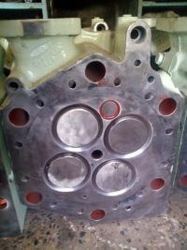 Special purpose tooling can be designed and developed incase of limitations of working space in engine block. We have vast experience of having repaired over 10,000 shafts which includes crankshaft repair on site and also in our workshop. Onsite Metal Locking with imported metal locks from UK is done. We undertake repair by metal locking process having a thickness of even 5 mm. We undertake repair, reconditioning resizing of connecting rods. Crankshaft, Alternator shaft, Rotorshaft, Pump shaft is rebuild and grinding is done. Skoda generator spares are supplied. Industrial Skoda Generators.